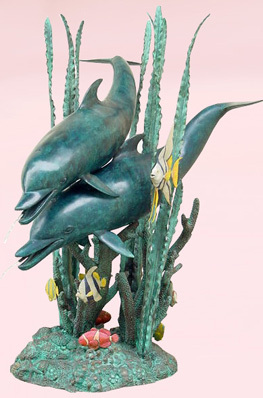 This Double Dolphins on Seagrass Fountain is made of highest quality bronze. This spectacular outdoor dolphin fountain is meticulously sculpted by hand and cast by the "Lost Wax" method, one at a time, ensuring exceptionally fine detail and lasting beauty. "Lost wax" casting dates back thousands of years. This is the most precise metal casting technique in existence, ensuring accurate reproductions of the original sculpture and exquisite detail. While modern methods and materials have improved the technique, it is still an extremely labor intensive and expensive process.